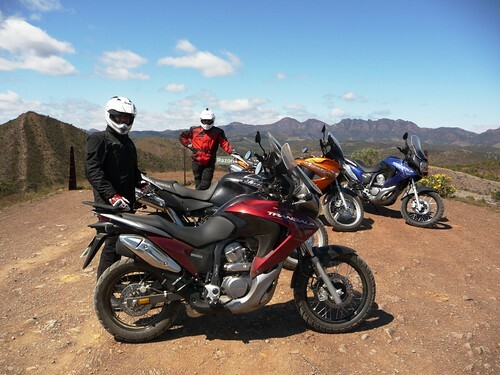 IndyCar champion, Dario Franchitti, escapes the high powered world of elite motor sport for a fun dare – to ride, drive, walk and float between Australia’s highest and lowest points. Roderick Eime joins the adventure. The excited call came from beneath the tinted visor of an Arai crash helmet. The plastic quickly flicked open, revealing the face of Dario Franchitti, 2010 Indianapolis 500 champion, eyes as wide as plastic picnic plates. After twelve intense months imprisoned within the concrete, Armco and bitumen of the world’s racetracks, the last thing you expect to see is a couple of wild 6-foot flightless pedestrians making a clumsy attempt to cross the road in front of your Honda TransAlp motorcycle. “In a word, yes,” replied Mark, matter-of-fact. Mark is Mark Higgins, National Public Relations manager for Honda Australia and he knows that despite the fun and adventure the pair was having here in the unusually verdant Australia outback, his good mate must be returned in perfect working order to complete a rigorous test program for triple championship-winning Target Chip Ganassi’s 2011 campaign. More at home in his Honda V8 powered IndyCar at over 300kmh on the back straight at the “brickyard”, Franchitti has accepted Higgins’ challenge to drive from Australia’s highest point, Mt Kosciusko (2228m) to the lowest point, Lake Eyre (15m below sea level). Instead of some break-neck Cannonball Run, this will be a leisurely tour, taking in some of the country’s scenic highlights en route. Fresh from a season’s end celebrity drive at the Gold Coast, Dario arrived in Canberra for the start of the high-spirited, low octane adventure which would begin with a small fleet of Honda four wheel vehicles decidedly slower than he was used to: a smart Accord VTi 2.4, sporty Accord Euro, racey Civic Type R and two stalwart CRVs in support, one towing a trailer. The very visible Canberra start was no Le Mans-style dash, rolling grid or even a ribbon snip. Instead, the beginning of the cross-country challenge was celebrated with a ceremonial cutting of the parliament house lawn with specially prepared Honda Buffalo Buck lawnmowers. Bemused locals craned for a better view as the 4-Stroke GCV160 OHV/OHC engines hummed almost silently in front of the country’s most important building. En route to the top of Australia and accompanied by a hand-picked band of motoring journalists, Franchitti revelled in the traffic-free alpine roads, punting both the Type R and Accord Euro along effortlessly without so much as a tyre squeak. “It looks like Switzerland … it looks like Scotland …. it looks like …,” quipped Franchitti as the landscapes morphed from snow-covered alps to eucalyptus forest to lush pasture. Yet greater contrasts lay ahead. 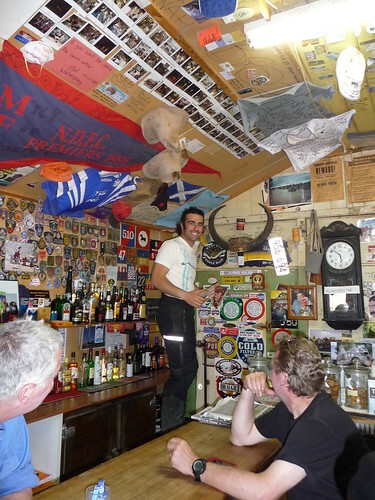 As the mountains gave way to river valleys, little towns and hamlets like Jindabyne, Corryong, Tallangatta and Khancoban played host to the anonymous racing star as he sampled local gourmet cuisine and simple fare alike. His most common request? Bundaberg Ginger Beer. “Damn fine brew that,” said Dario, a refreshed countenance washing across his three day stubble. 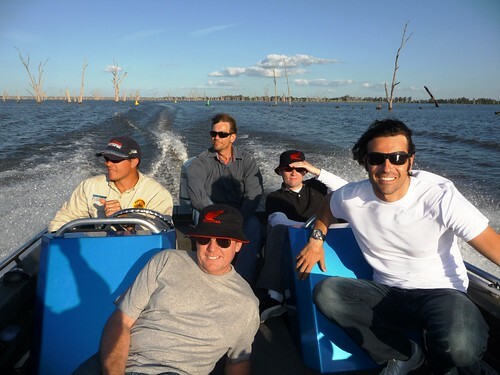 Despite visiting Australia annually for over a decade, Franchitti has seen little of the countryside besides the inside of his Gold Coast hotel and the early morning walk to the racetrack. His fleeting moments of inter-season downtime are usually taken up “shutting down” around his ranch in Tennessee or on an island resort somewhere secret and secluded with partner, Ashley Judd. Away from the track, Franchitti will also spend some time with his other distraction, a car collection that would have any boy salivating. A rare Porsche Carrera GT and Ferrari F40 among his favourites, but here along the peaceful riverside byways, there’s plenty of time to chat and just enjoy the drive. “I’m goin’ back again to Yarrawonga” sang Slim Dusty and if there is one thing to bring you back to this Victorian town on the iconic Murray River, it’s Lake Mulwala and its bounty of Golden Perch and Murray Cod. In 1935 a weir was constructed to dam the Murray, creating Lake Mulwala and flooding a redwood forest thus creating an artificial environment for these mighty native fish. Dario blessed the Honda 150 outboards that power the two Riverina Sport Fishing fast boats with his signature. This gesture assured his success and despite spending half his time dozing under the warm spring sun, he snatched the prize catch of the day, a 3kg cod. 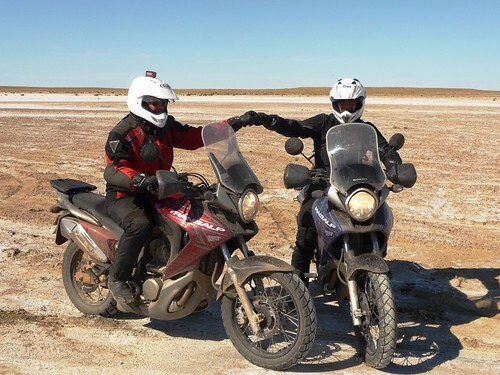 A layday in Mildura was supposed to be a familiarisation for the big Varadero and Transalp adventure bikes, but constant rain kept the team confined to barracks, nervously eyeing the heavens. Faith and some secret prayers paid off, and the sun fought through for the lads’ departure for the final leg to Lake Eyre and Coober Pedy. 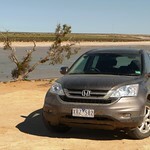 Four bikes followed by the two faithful CRVs headed out toward Broken Hill, Peterborough and Wilpena Pound. Under a star emblazoned night sky, the team spent their first night under canvas while circus master and road planner, Geoffrey, stunned them with succulent steak and choice Rutherglen red wine. Mark dug into his panniers and produced a couple of fragrant Cuban cigars to complete the evening. The tents, while generous and practical, lacked effective sound-proofing, hence some members were alerted to their raucous nocturnal habits over bacon and eggs the next morning. New tenting arrangements were hurriedly planned. Out of the rugged splendour of the Flinders Ranges, the entourage headed out onto the stark flat plains, following the vanishing route of the first Ghan railway, now rerouted further to the west. Past abandoned sidings, forlorn iron bridges and derelict water towers, it was hard to imagine that just 30 years ago, trains still made the slow journey to Alice Springs via Oodnadatta. The route is decorated with imaginative scrap sculptures and the former railway town of Marree even displays three stranded locomotives left behind after the tracks were torn up. The pub and petrol station is about the only activity these days. Out of Marree, the convoy was now officially on the Oodnadatta Track, a road traversed almost as a pilgrimage by 4WDers and off roaders. With water filling the normally arid Lake Eyre an added attraction, transient water birds and eager tourists alike were flocking to this once-in-a-lifetime phenomenon. In a twist of irony, Franchitti’s planned drive along the lake’s surface was thwarted for the same reason as countryman, Donald Campbell, in 1963. His land speed record attempt in the jet-powered Bluebird was postponed because the lake was full of water. The flip side is the that the Lake Eyre Yacht Club actually launched their boats for the first time in 25 years and even held a regatta. After a frenzy of celebratory photos, back-slapping, and high-fiving on a dry section of Lake Eyre South, the team heads to the fabled William Creek Hotel for an ABC Radio interview. Stony faced and deadpan licensee, Bruce Gordon, stares across the empty bar. “We’ve only got the peddle radio phone and you’ll have to do your own peddling, I’m busy at the bar.” He reels in unwary travellers by the busload with that one! The challenge complete, the team relax at another tent camp beside remote Lake Caddibarrawirracanna for a day before the final road leg into Coober Pedy. Shooting stars streaked across the vivid night sky, while satellites crept imperceptibly between the planets and distant stars. Dario knew that within a few short days he’d be back strapped into his Kevlar and carbon fibre cockpit, a howling Honda V8 hurling him down the track but, he assures us, his memories of the vast Australian outback will be there to take him away from all that.